It's hardly news that the iPhone can serve as a capable little music machine. But NanoStudio offers the complete music-making package, with synths, trigger pads, sequencers, samplers and much more—and, crucially, it makes them all intuitive to use. Complex apps walk a fine line between functionality and usability—there's nothing more frustrating than a feature-laden app imprisoned behind an inscrutable interface. 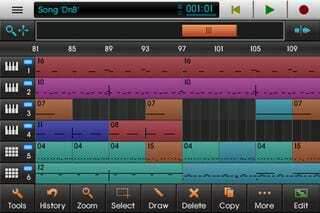 NanoStudio pulls off this tightrope act gracefully, packing everything you need to tap out drum loops, tweak synths, record and edit your own samples, and sequence and master it all, right on your iPhone.